As I sit here in the middle of August, I start to wonder which planes I will fly this winter. For many of us, winter is strictly building season, but there’s really no reason not fly year round. Unlike our glow-flying colleagues, we don’t have to do any tinkering in the cold to get our propellers turning. Just flip a couple of switches, and fly! There are a few things we should consider though. 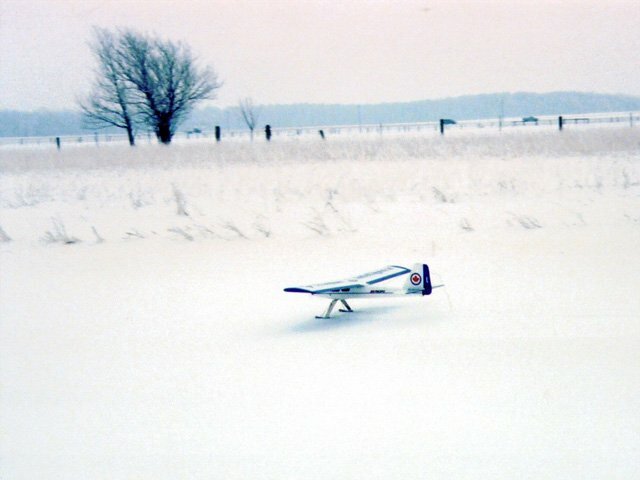 Flying R/C is not very vigorous exercise, and it’s easy to catch a chill or even frostbite when flying in the winter. This is made even worse by the fact that the R/C pilot is usually standing in a wide open area, unprotected from the wind. So the first order of business is to get bundled up warm enough for the conditions. 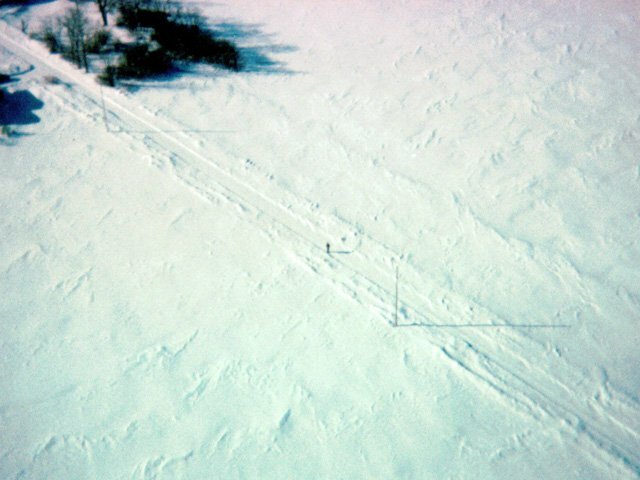 A typical winter flying landscape (the dot near the center is your author). The wind can be really cold when standing in an open field, so dress warmly. On cold days, I prefer a warm winter coat, snow pants, warm waterproof boots, and a toque. The latter is important, because a great deal of body heat escapes through the head. Even if the coat has a hood, I prefer the toque because the hood blocks my peripheral vision (useful for spotting utility poles on a collision course with your model). Another important part of winter flying apparel is a good pair of gloves. I’ve done a lot of searching for the ideal pair, and have found two ideas that work well. For slightly cold weather, I use a pair of ladies chenille gloves with little rubber grip dots all over them. These are reasonably thin yet protect well from the cold, and give a good grip on the transmitter or that plane I’m hand launching. For extremely cold weather, I use a three layer concoction I described in the October 2001 issue: a thin knitted ladies’ glove, covered with a latex surgical glove to block the wind and provide grip, covered with a thick wool fingerless glove. The reason both of these ideas involves ladies’ gloves is that there seem to be no good mens’ gloves useful for anything more precise than cutting down trees or roping cattle. It’s important to be able to feel the position of the transmitter sticks. One item that is extremely important is a good pair of sunglasses. In the summer, the sky is bright, and sunglasses are required. In the winter, the sky can be even brighter (because the sun is low), and the snow covered ground is brighter still. Without a pair of dark glasses, it’s easy to lose your model in the sky, or against the white fields. I use Zurich R/C sunglasses, because they are a wrap-around design which keeps the cold wind out of my eyes, and they are quite dark. It is well known that you can get sunburned in the winter, and that it’s a good idea to put some sun protection on your face. I’ve never done this, but I have to admit that my winter flying sessions are usually at most half an hour or so. Furthermore, I do most of my winter flying facing north to keep the plane out of the low-lying sun. However, if you plan to spend the whole day flying, I’d recommend a good sun lotion. Boots, snow pants, a warm jacket, gloves, a toque, and dark sunglasses are essential winter flying apparel. Now that we’ve taken care of the pilot, let’s look at any special considerations our equipment might need. Most modern electronic circuitry, such as that in your transmitter, receiver, servos, and speed control will work fine in extremely cold conditions. One notable exception is the liquid crystal display (LCD) found on most computer radios. In extremely cold weather, the display on a computer radio can become sluggish, or even freeze up and turn black. This is usually not a problem as long as you don’t need to look at the display to reprogram your radio in the field. The display should recover once it has been brought back into a warmer environment. The mechanical parts of the equipment are more prone to potential problems. Different materials expand and contract at different rates as the temperature changes, and it is possible for a slightly loose connection or a cracked circuit board to suddenly become inoperative. Therefore, it’s important to let your equipment adapt to the cold temperature, and then to test everything, including doing a range check, before flying. Everything should work as well as it does in the summer. If it doesn’t, then something is probably amiss. Servos too can be affected by the cold. The nylon gears will become harder in cold weather, and the grease inside the servos will thicken. They will most likely make more noise, and perhaps draw slightly more current than they do in the summer time. As long as they are moving freely, no harm should come to them (they might be more susceptible to crash damage though). When you’re done flying for the day, turn everything off, and take it home. Once you get it inside, let everything sit for a few hours before turning it back on. Condensation will often form on the equipment both inside and out (especially if your home has a humidifier), and it’s important to let this dry off before applying power. Putting everything in front of a fan will help. The good news is that current flows more easily through cold wires than it does through warm wires, which means that electrical losses in your plane’s wiring, speed control, and motor will be less. The bad news is that our nickel-cadmium (NiCd) and nickel-metal-hydride (NiMH) cells don’t work as well in the cold. On a bright cloudy day, the lighter colored parts of a plane can disappear against the background. To get around this, it’s best to use the battery packs when they are fresh off the charger. Most chargers leave the packs slightly warm at the end of the charge, so using them right away will result in better performance (if the packs are warm, they won’t know that it’s cold outside). On subsequent flights with the same pack, performance will likely improve, since the packs tend to get very warm during flight. If you do charge several packs before going to the field, keep them in an inside pocket in your coat, or in a cooler with a heat pack or hot water bottle. One advantage of the cold weather is that it doesn’t take very long after a flight to cool the pack down enough to recharge it. A few minutes in the icy breeze is usually sufficient. If you’re in a real hurry, place the pack in a waterproof bag and set it in the snow. Warm packs also make good hand warmers between flights. Various models are affected by temperature to varying degrees. Some plastics become very brittle in the cold weather, and are prone to shattering. This can make some ARF models a bit fragile during winter flying. A crash that might have resulted in a bounce or minor damage in the summer can produce a jigsaw puzzle in the winter. Even built-up kit models can suffer this problem with their plastic covering materials. 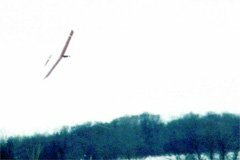 I once made a "poor landing" with my Great Planes Spectra sailplane, and had all the Monokote on one wing panel break into lots of little pieces. In general, the potential for damage is only higher during bad landings or crashes. I’ve never had a model damaged in the course of normal winter flying. One thing to check before flying is the position of all the control surfaces. Depending on the materials involved, your model and the pushrods can shrink at different rates as the temperature drops. Some brands of nylon pushrods have this problem when used in balsa models. Others, like the Dubro Lazer rods, don’t seem to change length at all relative to the model and are great for winter flying. If you don’t mind the slight extra weight, 0.070-inch steel pushrods work well too. I switched to these in my Sig LT-25 when I found serious trim changes during winter flying. If you do use pushrods that change length, be sure to let the model cool down to the ambient temperature before the first flight, and then adjust the trim. You might still find trim changes are required in flight, depending on how warm it gets inside your model from the motor battery. One final consideration is the propeller. Just as the nylon gears in the servos will become harder and more brittle, so will a nylon propeller. Make extra sure that there are no nicks or scratches in your propeller, since it is far more likely to shatter in the cold weather than it would in the summer. Better yet, use a wooden propeller. There’s nothing quite like flying from skis, especially while your glow-power buddies are freezing their nitro-covered fingers trying to start cold engines. If you are flying hand-launched models, there’s really no difference from summer flying. Just make sure your gloves have enough grip that the model doesn’t slide out of your hands when you launch it. In my opinion though, there’s nothing as beautiful as taking off and landing on skis (well, taking off and landing on floats is probably more beautiful). There are a number commercially available skis in a variety of sizes, and most come with fairly detailed instructions on how to mount them. These are usually sold in terms of the size of glow plane they are meant for, so you’ll have to use your judgement as to the best size to get for your model. As a rule of thumb, you’ll want about 14 square inches of skis per pound of airplane. I’m generally not one to buy something I can build myself, so all my skis have been homemade. You can find ski construction details here. 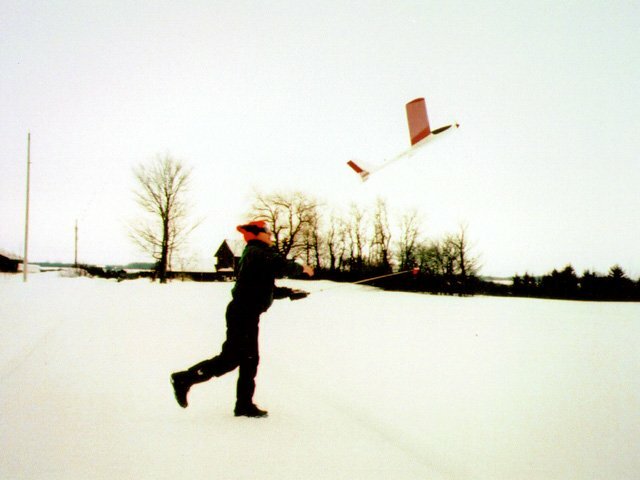 Even if your model is normally hand launched, consider adding a set of skis for winter flying. 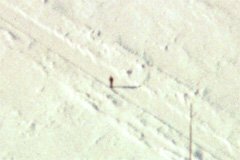 As a matter of fact, I flew my hand-launch models from skis for several winters before ever flying a model with wheels. 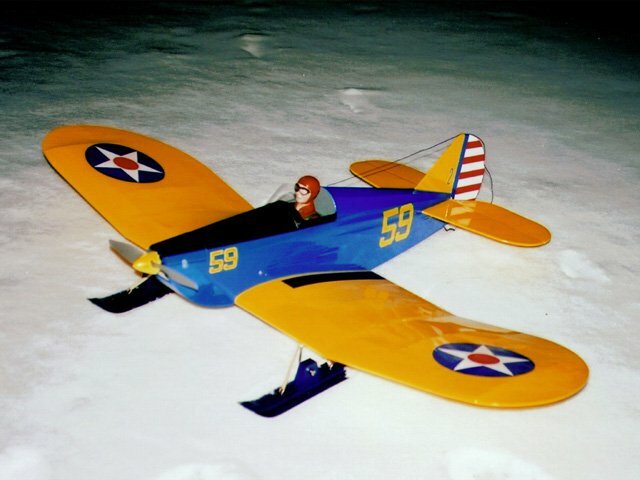 If your model has floats (or is a flying boat type design), you can fly it from the snow as-is. There’s no need to switch to skis. 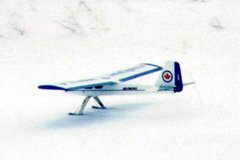 It is said that the Inuit have dozens of different words for snow, and I’m sure they have a few for the kinds of snow suitable for winter R/C flying. Unfortunately, I don’t know what they are, so we’ll stick to English. 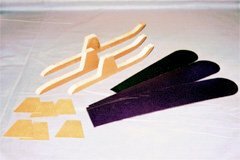 The components of a set of homemade skis for my Sig LT-25. Fresh snow is the least suitable, because it is too soft. If your model sinks into the snow more than an inch or so, you’re probably going to have trouble getting it to move. Snow that has been sitting for a few days is better. It will have had a chance to settle and become firmer, giving a good base for the plane to travel over. Very hard packed snow and even ice work too, although ground steering becomes difficult, since the model can slide sideways as easily as it can slide forwards. 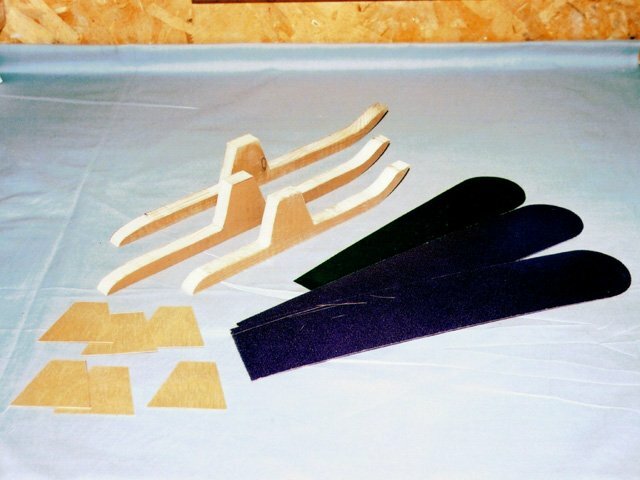 Some skis come with optional skate-like blades which bolt on for operation from ice, making it easier for the plane to track in the direction it is pointed. Wet snow can be troublesome, as it tends to stick to the skis. Although I haven’t tried it, a good coating of an appropriate ski wax might help. The amount of snow you need depends on the surface under the snow. If you are flying from a plowed field, you’ll need a lot of packed snow to fill in the bumps and furrows. A mowed grass field on the other hand requires very little snow. I fly from a hay field, which usually has about 10 inches of growth by the time the snow falls, so I have to wait for four or five inches to fall and flatten the hay before I can fly. The few bits of hay that stick through the snow are usually not a problem. Unless the snow is hard packed, be careful where you walk. It’s all to easy to fill your flying field with holes that your plane can fall into while taxiing. If possible, land with some power remaining so you can taxi back to where you are standing, rather than having to walk across the field to retrieve your model. The Great Planes SlowPoke also flies well from skis. The difference between flying on a hot summer’s day and in the depths of winter is quite astounding. Take-offs are quicker (unless the snow is thick), and climb rate is greatly improved. The reason for this is that cold air is much denser. For example, on an 80 Fahrenheit (27 Celsius) day at 1000 feet above sea level, the air is equivalent to 2500 feet above sea level. But on a 5 Fahrenheit (minus 15 Celsius) day at 1000 feet, the air is equivalent to 2500 feet below sea level! That’s a 5000 foot difference, or the difference between flying on the coast or in Denver. 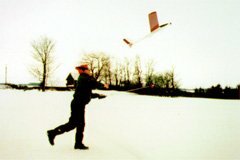 So, with all the advantages that electric models have for winter flying, why not go out and keep your flying skills current? I live in Manitoba. I am an aviation/portriat artist, and fellow RC pilot (TREX 600 ESP Helicopter). I have some experience flying RC planes with a trainer. My buddy says I’m good enough to go ahead by myself. 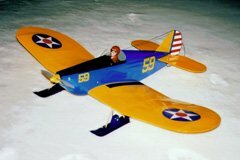 Do you or someone you know have any experience flying one of these in the Winter? The reason I ask; the pdf from the German site says the operating temp. range is from -5 C to + 35C. Not sure if this is possible, but it would be fun to extend the receiver antenna to the roof of my house, and have the video feed directly to my iMac computer screen, while I sit in my chair using my Spectrum DX8 transmitter. Getting to the point… I’m concerned about flying the glider at temperatures lower than -5C. Any referrals on this matter with my idea(s) would be appreciated.